Dare to Get Dirty Continues! DTGD15cathymac DTGD15TexasGrammy DTGD15ohmypaper! 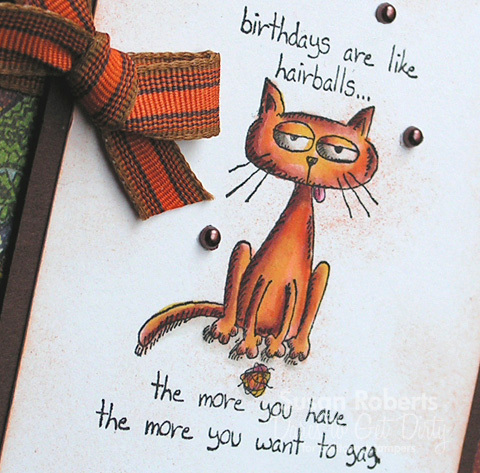 It’s Day #3 of the Dare to Get Dirty Challenges over at Splitcoaststampers. This first card was made with with a couple of the challenges in mind. I love everything miniature, so when I first saw these cute little clothespins I just had to have them! Some sun rays were stamped and are peaking out from behind the onesie. This second card is for one of the challenges. This ole cat just cracks me up. He was colored with some warm Copics. Thanks for stopping by today. Maybe I’ll see you over in the DTGD Galleries! Both great Susan My favorite is the fur ball kitty cat! You did such a nice job of coloring. It’s such a fun stamp set. Oh, Susan, I love each of these! Adorable first one, and the second one is hilarious! What fun! Looks like you are keeping busy this week too! Hugs! These are both really adorable!! Love that tiny heart on the onsie and the kitty one is just too funny!! 🙂 Brilliantly done! I absolutely love the baby card- and the way you used the sunshine stamp to work with the phrase too!! Clever! 😀 I love how you colored the cat too! I love baby cards! So cute! And kitties, too. Even kitties hacking up hairballs. Love that set. 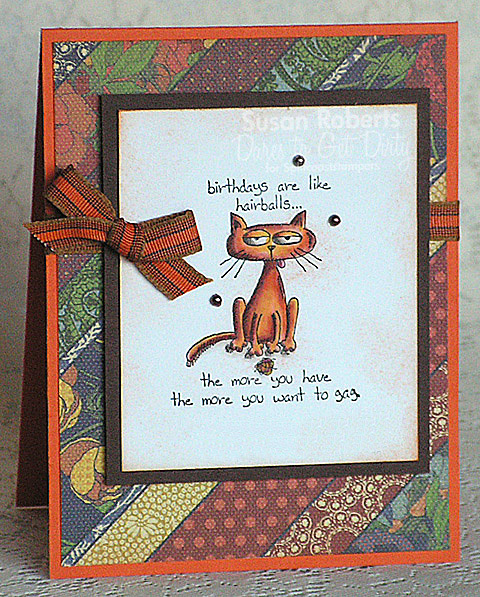 Great cards, Susan! After a long hiatus from crafting, blogging and checking some of favorite blog posts, I am back. So happy to see these adorable cards in my inbox!